How Will US Demands For Pakistan to 'Do More' on Terror Work? Taking a “conditions-based” approach, the United States wants Pakistan to do more to fight extremism. U.S. Secretary of State Rex Tillerson visited Pakistan earlier this week with the clear intent of forcing Islamabad into taking action against a range of militant proxies that allegedly continue to find shelter inside Pakistan’s borders. Pakistan for its part claims that there are no militant proxies inside its borders anymore. However, the United States has made clear that unless Pakistan isolates the Afghan Taliban’s support bases, which allegedly have roots inside Pakistan, peace and reconciliation in Afghanistan will be impossible. But the question remains: Can both these countries cooperate when they do not perceive their strategic interests in Afghanistan identically? So, the bottom line is as follows: Washington continues to believe that unless Afghan Taliban safe havens in Pakistan are crushed and neutralized, the chances of the Taliban joining any peace process are zero. For Washington, Pakistan appears to be the key challenge that is hindering the Afghan peace process by continuing its alleged support for various militant proxies in Afghanistan. After the rescue operation, many in Islamabad were hoping to restore some level of trust between the two countries. However, it appears that while Trump may have lauded Pakistan’s hostage rescue effort, it doesn’t change the strategic dynamics that are in play between Washington and Islamabad. While Islamabad tried to present the rescue mission as an effort that underscores the country’s enduring commitment against terrorism, Washington termed it as a policy change on Pakistan’s part, demonstrating that it now respects the United States’ wishes. Clearly the way Tillerson was welcomed in Islamabad shows that the latter neither appreciates nor is ready to act on U.S. demands to do more. America’s top diplomat was quietly welcomed by a mid-level Pakistani Foreign Office official at a military airport. Tillerson’s total stay of four hours in Pakistan, in which he communicated a message that Washington has delivered to Pakistan countless times during the past decade, shows that the trust deficit between the two countries still remains an issue. 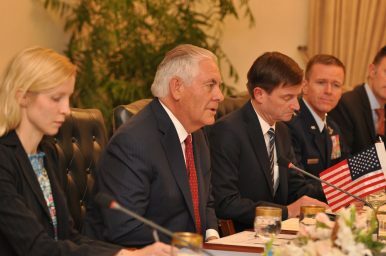 Reportedly, Pakistan’s civilian and military leadership briefed Tillerson about the country’s recent counterterrorism efforts, which have reportedly eliminated all major militant sanctuaries in Pakistan, and also expressed concerns related to its own security situation, which remains under threat from militant hideouts in Afghanistan. Moreover, one of the core concerns that may have also come under discussion is Washington’s continuous demand for Pakistan to “do more” while Islamabad’s own strategic security concerns remain unaddressed. Surprisingly, none of Pakistan’s longstanding demands related to India’s role and Afghanistan’s own domestic handicaps when it comes to the country’s deteriorating security situation figured in Tillerson’s statements. On the other hand, for Islamabad, Afghanistan, India, and the United States appear to be uniting forces to isolate it in the region. It would have been a much wiser approach if some of Islamabad’s grievances were also addressed during the visit. The one major occasion when Tillerson called Pakistan an “incredibly important” partner was in the context of the challenges that Pakistan faces from militants and regarding what it can do to diffuse some of these challenges that the region faces, particularly in Afghanistan. Arguably, such a low level of trust between the two countries leads to a lack of trust between Pakistani and U.S. representatives. Unless both countries bridge the existing trust deficit and come to terms with each other’s interests in Afghanistan and beyond, peace will not return to the war-torn country. Khan should heed the lessons of his predecessors as he assumes the reins of power in Pakistan.